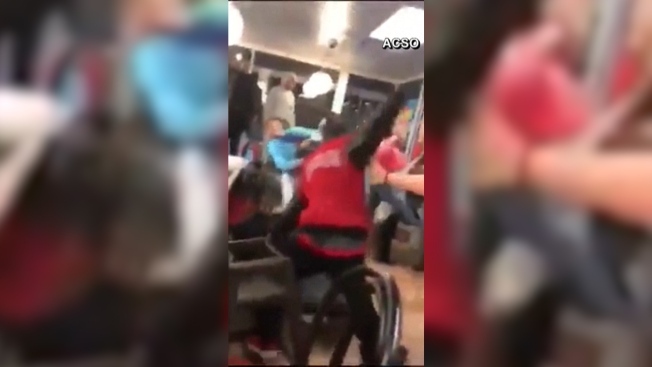 A massive fight caught on camera at a Lima, Ohio Waffle House is attracting some unwanted attention online. According to the sheriff's office, the first of two fights broke out at 3 a.m. Tuesday morning inside the restaurant and involved several men and women. Investigators are looking for information about the people seen in this video, who were part of the fight inside the restaurant. That brawl ended before deputies arrived. A second fight broke out in the parking lot in front of deputies, and they arrested 26-year-old Moniqua Lasenby and charged her with persistent disorderly conduct. Twenty-two-year-old Nahporchia Allen was charged with a misdemeanor charge of disorderly conduct by fighting. It is unknown what involvement they had with the fight inside the Waffle House. A female victim came forward Wednesday, and deputies are continuing to investigate. It is not clear what led to the restaurant-clearing brawl.